If Sabrina Frederick-Traub is sure about one thing, it’s that she wants to play without any regrets. 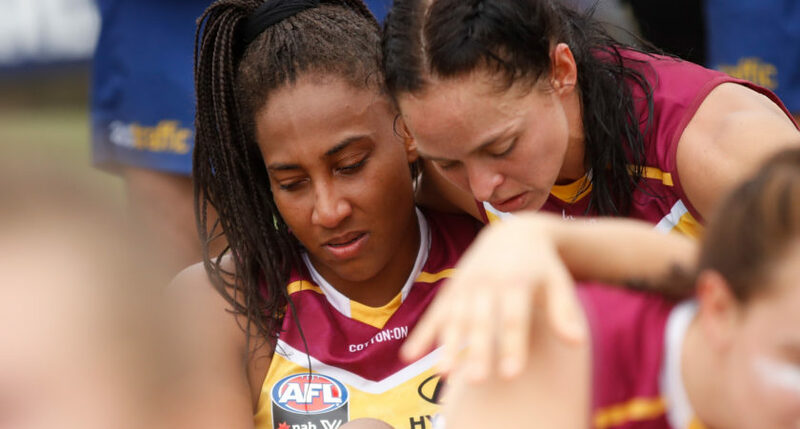 The key forward has endured the pain of two agonising AFLW Grand Final losses, falling just six points short on both occasions against Adelaide in 2017 and the Western Bulldogs in 2018. Though grand final day is still raw, she remains optimistic that a new year presents a new opportunity. And the key aspect that she has learnt from those losses is that every little thing counts. “We were one kick away in both finals, and when the margin is that close you have to break everything down,” Frederick-Traub told AFLPlayers.com.au, just two weeks out from the season commencing. All of those little aspects have the potential to come to mind when it’s so close, which is why the athletic forward wants both defeats to be viewed as a learning experience. “You want every single day to count, that was my biggest learning from both of those losses,” she explained. As they embark on a new season, Frederick-Traub declares that the feeling amongst the Lions is overwhelmingly positive. She is also optimistic about the benefits of the expansion of the AFLW competition to 10 sides in 2019, and believes the club will be able to cover the loss of a number of key players who switched clubs in the off-season. Even though it is a new challenge, it can still be presented as an opportunity. “With two new AFLW teams on board, there are two new teams’ worth of females who will be given the opportunity to play at the highest level,” Frederick-Traub added. There have also been changes within the leadership group at the club, with Leah Kaslar taking over the captaincy from Emma Zielke, with the club deciding on a four-woman leadership group featuring Zielke, Kate Lutkins and Sam Virgo. “Zilks (Emma Zielke) did an amazing job over the last two years to lead our club to where it’s been,” she said. Born in England, Frederick-Traub was introduced to AFL while growing up in Perth, but made the decision to move across the country in 2016 and hasn’t looked back. She now works for AFL Queensland and recently became engaged to her fiancé, Lili. “Football is important and it’s awesome to be part of a club that supports you, but the other part of your life has got to be going well, too. You’ve got to be happy where you are in order to want to stay.